“Origin”, for us the most important quality feature. The growing areas of our wines – the terroir is predominant . . . Representing the vineyard-locations, climate and the soil conditions of our vineyards in Southern Styria. The “birth” of great wine is in the vineyard. This means that “winemaking” already starts in the vineyards because the quality of the vines and their grapes primarily, secondly and thirdly depend on the quality of the terroir where the vines are growing. The next important steps of vinification are the management of working in the vineyards and the handling in the wine cellar. Here again, we count on the terroir and on the nature. Both are superior to human. How can we support natural dynamics at best and let nature takes its course? How can the terroir be expressed in our wine at best? The making of wine is a craft, down-to-earth and close to nature – nature is an enormously valuable heritage, this needs to be respected. The development of our wines affected by natural processes . . .
all wines are exclusively fermented with natural yeasts. All grapes are harvested by hand . . . The harvest of our grapes is the most important time of the wine year, at the same time the most critical time. Only by a very careful selection, the grapes deliver the high quality of our vines into the cellar. Due to a very high inclination, our extremely steep vineyards need to be harvested by hand, which is the original and traditional way of the grape harvest. However, for us, quality is an even much more important reason. 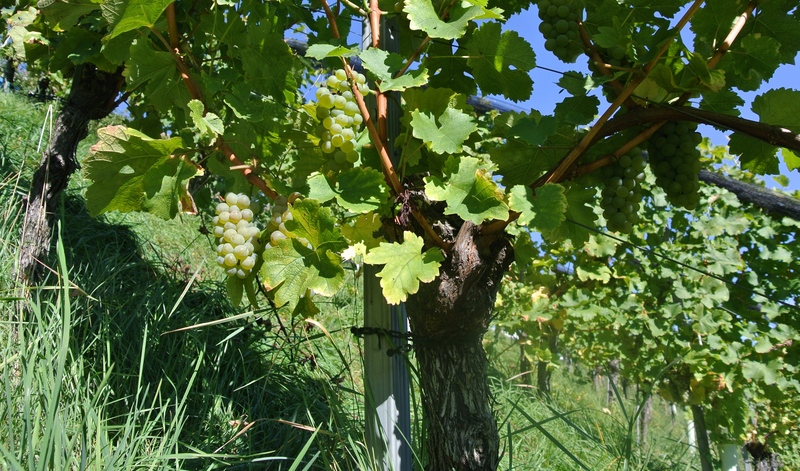 All vineyards are cultivated according to organic guidelines . . . Since 2016 our winery is in changeover process to be certified as an organic wine-growing estate. Moreover, for us it is of high importance to operate: In harmony with nature, in consideration of ecological aspects, with a high regard for environmental protection. In the management of our vineyards we rely on absolutely nature-friendly treatment measures, in the vinification only on natural processes. All wines are exclusively fermented with natural yeasts . . .
We vinify our wine in harmony with nature. Natural yeasts, also called “wild yeasts”, or “wild wine yeasts”, occur in the natural environment of wine. They live in the vineyards, on the vines, in the wine cellar and are deposited on the grape skins. By this way these yeasts get into the grape juice and effect spontaneously an alcoholic fermentation without influence of the winegrower, and this is defined as spontaneous fermentation. The spontaneous fermentation, a natural microbiological process, is the most natural and original form of winemaking. The natural yeasts, living in natural surroundings, are optimally adapted to the respective conditions. The in a wine cellar existing yeast population is composed of different strains. Each yeast strain is essential in the fermentation process. This natural interaction creates a complex wine. There is no better way to use even these processes of the nature to bring the nature into the wine cellar. The spontaneous fermentation, (fermentation only with natural yeasts), ensures the creation of wines reflecting their terroir. Furthermore, due to the spontaneous fermentation the expression of natural aromas in the wine is much more better and fruitier. The spontaneous fermentation is one of our steps to transmit the inimitable, unique character of a vineyard to the taste of a wine and to present an identifiable taste of the wine-growing area. The soil life is very essential for working with nature. Here are the first impressions of the new year: the sprouting of our vines, the planting of new vines and the pruning of our young plants. In the cellar the new vintage is going to be bottled. In this video you can see the bottling of our single vineyard wines and the bottling of our big bottles. There is a lot of work in the vineyard all year round. In this video the summer work in our vineyards and a soil sample from Pössnitzberg are shown. Now the harvest is imminent. Enjoy the views over the beautiful landscape of the Southern Styria and get insights of the laborious manual harvest in our extremely steep vineyards. There is no winter rest – there is a lot to do all around the year, in the vineyard as well as in the wine cellar. This video illustrates the work in the barrel cellar and shows the wintry pruning.